Pal Promo Fare 2014: Philippine Airlines welcomes the Chinese New Year with big and exciting news! Your Home in the Sky, the BIGGEST Carrier to Japan, will now fly 5 times daily to Tokyo, Japan: 3 times daily to Narita, Tokyo and starting March 30, 2014, 2 times daily to Haneda, Tokyo. PAL also has daily flights to Osaka and Nagoya and 5 weekly flights to Fukuoka. PAL PROMO FARE 2014: Explore our country's beauty with Your Home in the Sky's lowest fares! Book now before seats fly! PAL PROMO FARE 2014: This 2014, fly to Japan with Your Home in the Sky! Book now before seats fly! 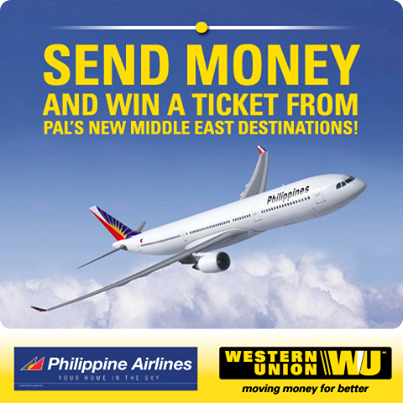 Pal Promo Fares 2014: Send Money Via Western Union! Good news to all our Kababayans in Saudi Arabia (Riyadh and Dammam)! Get a chance to win PAL return tickets when you send money from KSA to Philippines through Western Union! (Money in Minutes) to Philippines are eligible to join or participate in the promotion except employees of Western Union and their immediate families and its Agents and affiliates/agencies associated with this promotion. Promotion period is from 21 November 2013 to 20 January 2014. Every transaction/MTCN made during the promotion period regardless of amount entitles the customer to one (1) raffle entry and two (2) raffle entries for MyWU or Gold Card members. Raffle entries are automatically entered into an electronic raffle. Only paid-out transactions qualify as electronic raffle entries. There will be a total of four (4) winners weekly for nine (9) weeks or a total of thirty six (36) winners during promo period and to be drawn on 06 January 2014 and 28 January 2014.